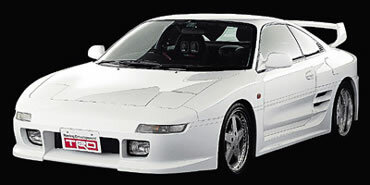 Hi, from what I understand a VIS TRD 2000GT bodykit has the best fitment for a clone? I'm looking on different websites and it advertises as full body kit but it only mentions only 4 pieces. Why is that? Not sure what websites you are looking on but the best thing to do is contact the seller and clarify what it is your getting, some sites don't include all the items for example leave out the spoiler or the fuel cap. So its best to just check with them to be sure. AFAIK flashharry admin on here used the VIS kit, though I think he ordered directly from VIS. As mentioned mines a VIS kit but do buy it direct as a lot of sellers claim its a VIS when its just a copy. Hey guys who bought the VIS bodykit. Did your kit include the trunk lid extension piece ? Me - see link in post previous to yours for pics. Yes but I bought one with out the spoiler 'wing' and asked VIS about it and they say trunk lip is part of the wing ? ?